Wall Decals & Wall Stickers : Gone are the days of boring wallpapers, it's the time to get more creative with wall Decals designs. Do you want to do a makeover for your baby room? Well you can go all cartoony or use a splash of popping colors and get creative with DIY wall decals. 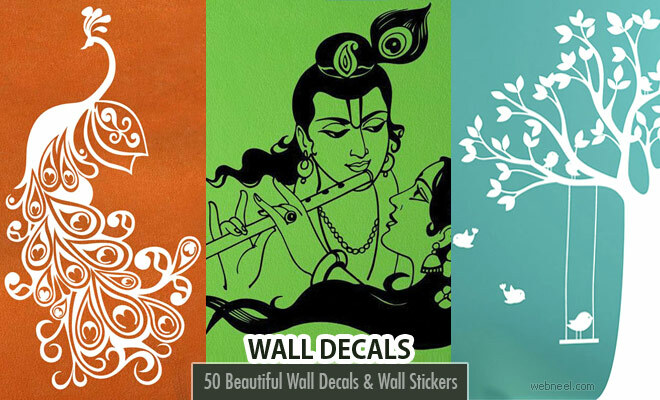 Are you planning on a party at home, you must be bored with your old wall paintings, well it's time to get creative and get dirty, try one of these DIY wall decals and surprise your guests. If you are from a large family, you sure would love to have all their pictures with you, so here is a great wal art idea for having all their pictures at one place. Paint an amazing banyan tree or just about any tree which has plenty of branches, let the framed pictures sit on those branches and you have done an amazing wall painting. We have put together some of the best wall Decals & Wall Stickers for your perfect home makeover. If you liked this post, please share them with your friends and visit our website for more such inspirational stuff.